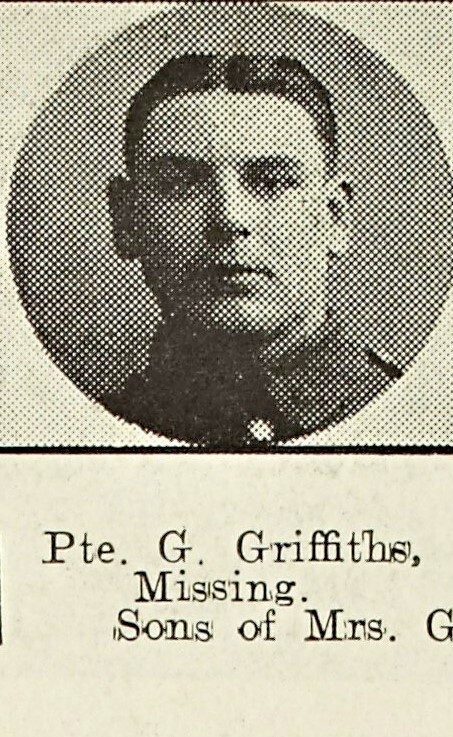 George Griffiths, who was a sniper with the 2nd Worcesters was reported missing in the Malvern News on 7/7/17. Three months later Mrs Griffiths of Tan House Cottages, Upper Howsell received a letter from the Enquiries Department of the International Red Cross for Wounded and Missing Soldiers regarding her husband. 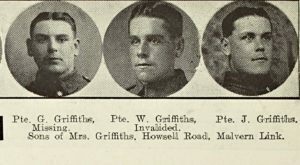 The letter conveyed statements from a wounded soldier in hospital, who said that Sniper Griffiths and several other men went over the top at an unspecified place [Croisilles]. They got past the German front line and were still advancing, trying to keep in touch with another Regiment. To this Regiment they called out. An answer came to them to go straight ahead. They did so, and ran right into the Germans, who had evidently called out to them in English and thus deceived them into thinking they were the British regiment. The narrator was wounded, but got back safely. Sniper Griffiths’ party was practically surrounded and his comrades thought if alive he must be a prisoner of war. The letter added no further news. 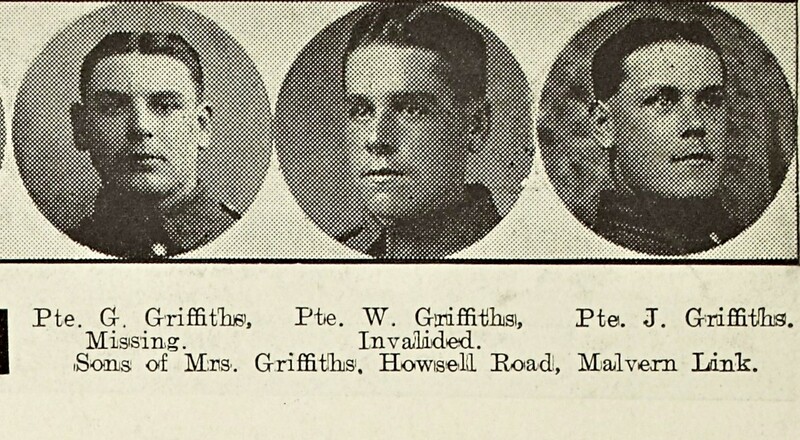 Griffiths however was not taken prisoner, and was deemed to have been killed in action. The action in which the 2nd Worcesters had been involved in had been the last of the Arras offensive, on the Hindenburg Line. The battalion deployed in four waves and attacked at 5.15am. The first two waves captured the front line, and the second two attacked the support line – this was seized, but with heavy casualties. For 24 hours the troops defending the captured German front line withstood a hail of bullets, bombs and shell fire without assistance. By the night of the 21st, the fighting died down and the battalion were relieved. They had suffered heavy casualties. The Battalion had gone into action with a battle strength of 530 and came out with 280. Two officers and 34 other ranks were confirmed killed; 5 officers and 134 other ranks were wounded; and 73 other ranks were reported missing – obviously Griffiths, who had probably fallen during the opening stages of the attack, beyond the German front line was one of them. George Griffiths was one of three brothers affected by the war.